Inexpensive - but not crappy materials. I found different types of resin/plastic/rubber tiles that looked like a great option. The reviews were great. The only problem was that most cost $3-$6 a freaking tile! Um, no. I dreaded the idea of the labor involved with stone tiles, but it was looking like my only budget-friendly option. Then, the best thing happened! 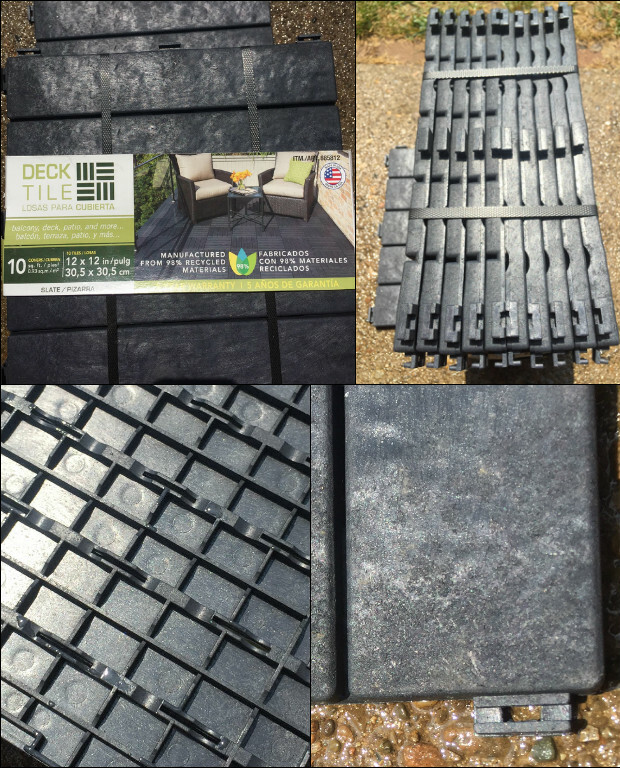 I was walking through Costco, buying things for my Fourth of July party, and came across a box of deck/patio tiles made from 98% recycled materials, super light weight and best of all, really inexpensive. Like just under a dollar per tile! Unsure if it was going to be too good to be true, I only bought 4 boxes of ten tiles each, or roughly enough to cover the space under our existing table. Which was sitting on dirt and dying grass due to issues from the TruGreen Total kill debacle. It's been two years, and the ground in some areas may not support vegetation for another year or two. Withing thirty minutes, I had the tiles down, snapped together with the table nestled on top. 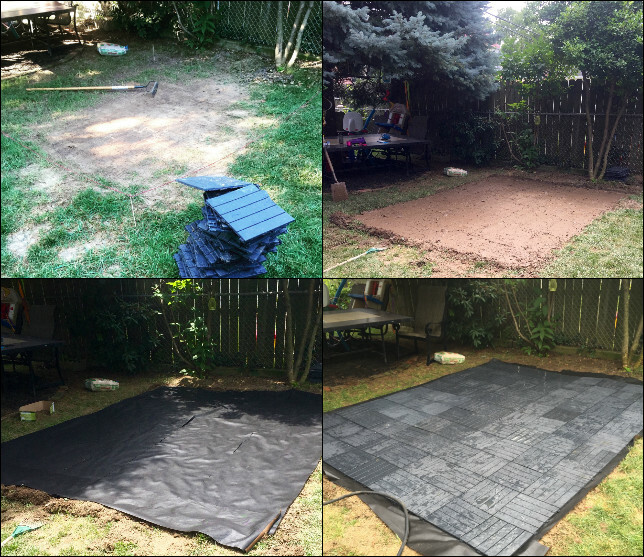 The only issue was the ground was so uneven, it was going take so much work to make it flat enough for a patio. Back to researching was to level the ground to support a patio, without breaking my back. Dammit, these tiles were going to work! The next morning, I had a plan. A good one. First, I went to Costco and bought the last seven boxes for a total of 110 tiles. Then I ran to a garden center and got the thickest weed barrier I could. I was now in for a total of $130. This HAD to work. Once home, I marked out the-the 9x11 space I needed to fit the table with plenty of room for the chairs. 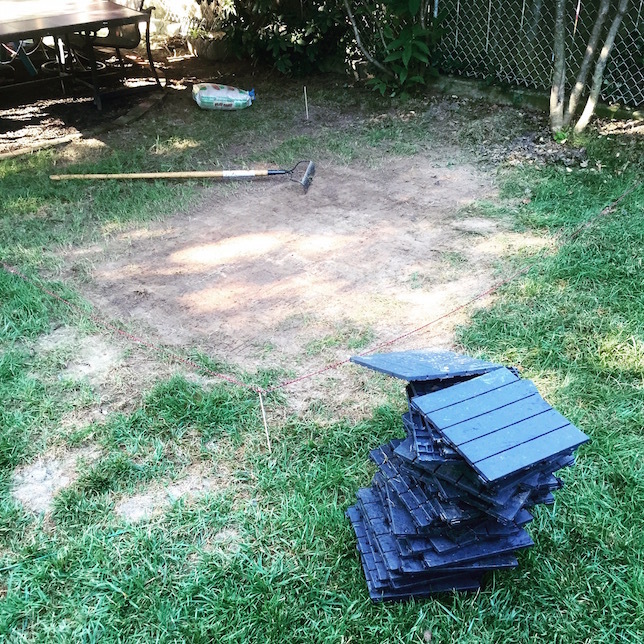 I took a hard rake and started breaking up the ground to make leveling a little easier. I hosed the space down once fully raked. According to my research, it helps to level and pack the dirt under the weed barrier. I used the back of the hard rake to smooth the surface out. Then the fun part! I measured, cut, positioned the weed barrier over the prepared dirt. It hosed off and drained beautifully and works better than I imagined. I put a layer of mulch around the side to help with irrigation and to hide the edges. 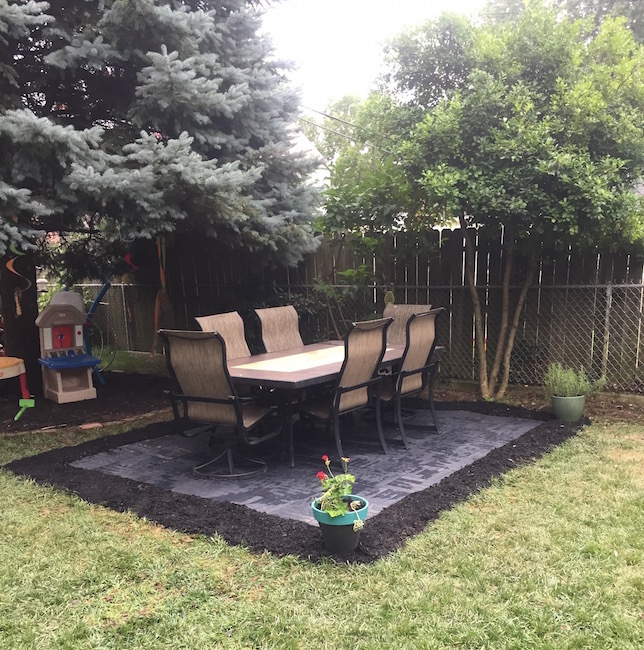 Nearly a year later, the patio looks like it did the day I finished it. The best part is that the tiles are made from recycled materials and work insanely well on uneven surfaces. They sort of roll like a wave over the large root of one of the trees and stays snapped together. 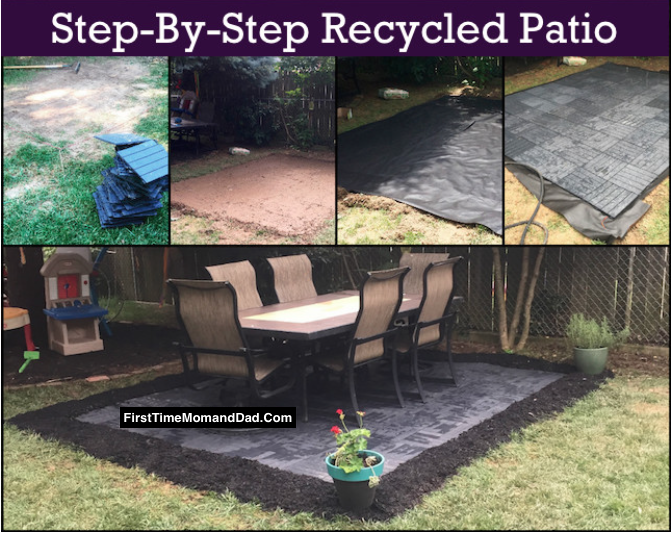 I seriously cannot recommend this type of patio enough to someone looking for an inexpensive, easy to move and build a sustainable solution. The tiles shown below on Amazon are a little more expensive than I paid at Costco, but at least you can check them out here and read the details and reviews.